This year marks the 100th Anniversary of one of my favorite historical and Christmas stories, The Christmas Truce of 1914. I don’t want to spend time on the history or many of the facts about the Truce, you can Google those, this website “Christmas Truce 1914: Operation Plum Puddings” looks particularity good, instead I want to opine about some of the things that I have learned from it and share a couple of favorites Christmas videos/songs. 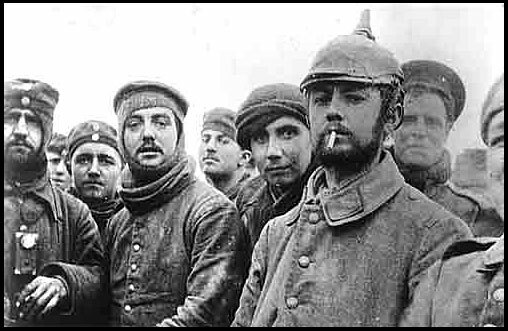 The Christmas truce occurred when British and German troops fighting in France began singing Christmas Carols to each other across “No Man’s Land” in 1914 and then arranged a temporary truce to take time to bury their dead together and celebrate Christmas. Earlier that month, on the 7th of December to be precise, Pope Benedict XV reached out to world leaders and recommended that a temporary truce be arranged for the celebration of Christmas. The leaders of the warring nations refused. No official cease fire was declared. Every thing that happened in the Christmas Truce of 1914 was a direct result of the soldiers in the trenches. This has taught me a few lessons. 1) No one is born full of hate or violence, they are things that we learn. Many years ago I was driving with my oldest daughter, she was about 3 at the time. It was near Christmas and the road in front of the local, recently completed shopping mall was very busy. I hat traffic and waiting in lines so I gripped, “I HATE malls”. Several months later we were driving on the same road, my wife was in the car with us this time. MY daughter spoke up, “Daddy HATES malls.” WOW, lesson learned. What if I had made a sexist, racist, or homophobic, etc. comment that day. I had taught my daughter that I hated malls. What if instead I had taught her that I demeaned women, hated Muslims, or feared homosexuals. Our children can and will learn to hate what we hate. The men on the Western Front in 1914 did not hate the men that they had been ordered to kill, so when they had the chance, they stopped. It was that simple, they stopped doing it. 3) HOPE – Peace is something that we can work at and achieve. It isn’t simple, there will be bumps in the road. Sexism, racism, homophobia and many other kinds of hate have been ingrained into our world for thousands of years and right now the road is particularly bumpy. Ferguson, Missouri, the middle East, cops assassinated in New York, children murdered in schools, children bullied into suicide, LGBT youth driven out of their homes, torture, you name it, violence and hate have been in our news lately. But so has hope. Some cops have committed horrible acts of violence, but others are handing out 100 dollar bills to strangers. There are stories of celebrities and others spewing anti-gay hate, but there was also this recent story of a 9 year old girl telling her gay teacher that she still loved him. The hope that the Christmas truce of 1914 gives me that normal “people in the trenches” can change nations and change the world may get battered sometimes, but it is still there. In the 100 years since the truce the world has suffered a lot, far, far, too much. But we have come along way too. In 1914 those men stopped the war for a day because they wanted too. Many years later I learned that my idle words could teach my daughter to hate or to love. It won’t be easy, and it will take lots of work, but if we are willing to step out of the mud of our trenches and reach out to our “enemies”, if we are willing to see the divine in all others, if we are able to let go of our bigotries and learn to not pass our hate and fear to the next generation, then we can have peace. And now, because I have jabbered and soap boxed and bored you all far too much, here is my favorite Christmas video. Back in 2002 Walter Cronkite appeared with the Mormon Tabernacle Choir. While the Choir sang, Cronkite, in the way that only he could, narrated the story of the Christmas Truce of 1914 in a piece entitled “Silent Night, Holy Night.” The following year it was released on video and PBS. My family (my wife is German) now watches it every year on the last night of Advent and I cry every time (don’t tell my wife). If you skip all of the drivel that I babbled, please watch this video.